Navigation: Click the project to view a summary of its plans. Tabs: View further details for the plan. Current activity and recent history: See whether the plan is building. Shows results for the ten most recent plan builds. Click a build number to view that build result. Run menu: Choose options for running the plan, e.g., run a parameterised build. 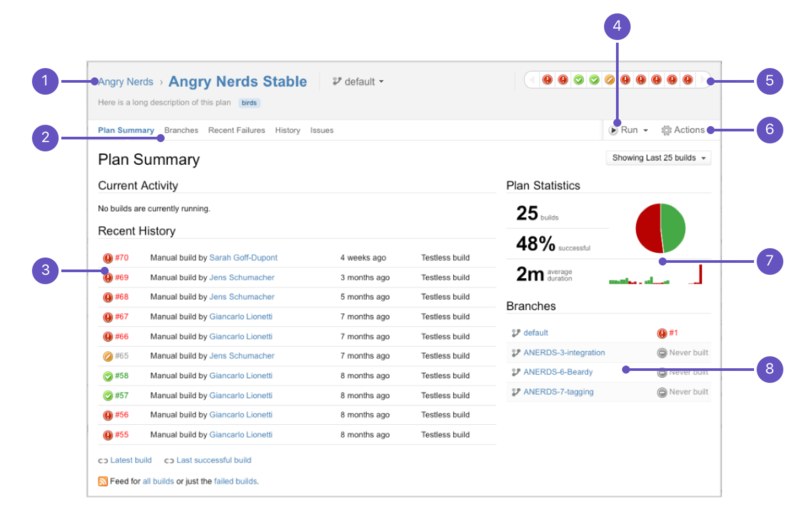 Plan status: Icons show if the plan is building and the status of recent builds. Click an icon to see the build result. Statistics and charts: For the build history of the plan. Plan branches: A summary of all the branches for the plan.